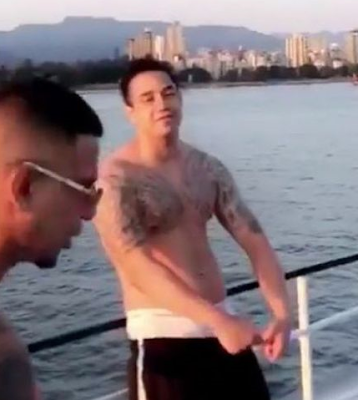 Matthew Alexander Navas-Rivas enjoyed a boat cruise a day before he was killed. Navas-Rivas admitted to other gangsters in the preceding months that he knew he was in danger. Sources confirmed that Navas-Rivas was targeted last January, as was his close associate Troy McKinnon who was murdered in Nanaimo. Violence occurred in federal prison, including two stabbings of Wolf Pack assassin Dean Wiwchar. Wiwchar was attacked in Kent Institution, allegedly by inmates associated with McKinnon and Navas-Rivas. Both men were associated with the Wolf Pack. 28-year-old Matthew Alexander Navas-Rivas became the city's 12th homicide after being shot just before 8 p.m. near a school. Navas-Rivas and a friend were walking their dogs when a person approached and shot him at point blank range. He was taken to hospital but died a short time later. His friend was unharmed. Navas-Rivas is well known to police and was involved in gang activity. He was arrested in January on 39 gun charges. In 2013 he was convicted of holding a family at gunpoint. Both he and his co-accused in that case, Derek Stephens, are tied to the Independent Soldiers gang.